China’s wages have soared. They were about one-quarter as high as Mexico’s in 2000. 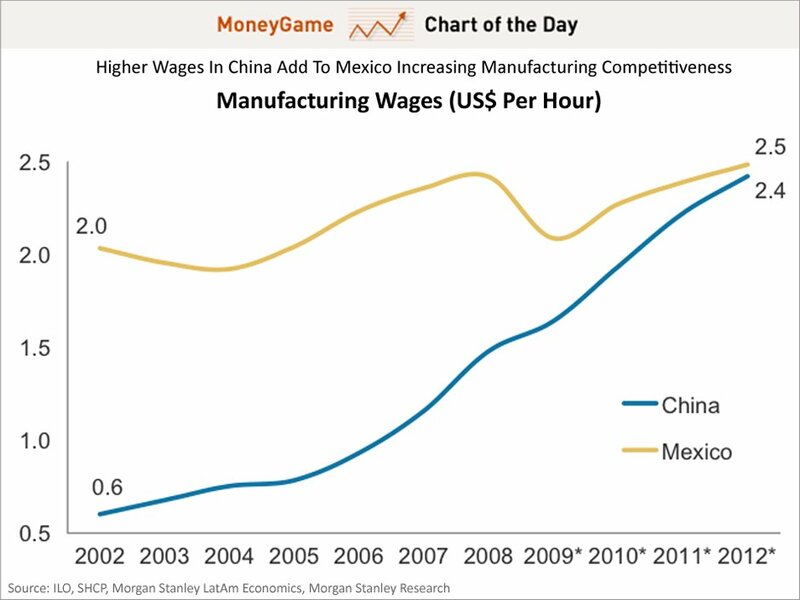 But today, wages in Mexico average 11% lower than in China. And when adjusted for Mexico’s superior worker productivity, it’s actually more like 30 percent lower than in China. Mexico has more free-trade agreements than any other country. The North American Free Trade Agreement gives Mexican goods easy access to the world’s largest market, the U.S., as well as to Canada. But that’s not all. Mexico has free-trade agreements covering 44 countries. That’s more than the U.S. (20 partners) and China (18) combined. Mexican manufacturing has a significant advantage in energy costs. Natural gas prices in Mexico are tied to those of the U.S., which are exceptionally low because of a glut of supply on the market. China pays from 50 percent to 170 percent more for industrial natural gas. Mexico also has an edge over China in electricity costs, although power isn’t as cheap in Mexico as in the U.S.
Industry clusters, especially in autos and appliances, are growing. Mexico has developed a national expertise in certain industries, which makes it more attractive for companies to locate or expand plants there. Because Mexico is a major auto manufacturer, 89 of the world’s top 100 auto parts makers have production in the country. The companies are concentrated in five Mexican states, reducing transportation costs. In appliances, more than 70 manufacturers are in the country, ranging from components makers to assemblers of both small and large appliances. “The American manufacturing renaissance has become one of the biggest emerging economic stories in the world. The basic idea is that rising overseas labor costs and falling domestic energy costs will encourage manufacturers to bring production back to the U.S. This is bad news for many of the emerging markets, which tend to be the low-cost producers. However, one emerging market could come out a big winner: Mexico. The clear likely beneficiary here for three reasons: i) recent outperformance on competitive grounds – it has gained market share in the US and automobile production remains an indirect threat to other less efficient LatAm manufacturers; ii) Mexico has always been strongly plugged in to the US manufacturing cycle and should remain a key part of the supply chain, thanks to NAFTA; and iii) Mexico’s structural reforms are likely to reduce structural rigidities at the same time as the tailwinds outlined above kick in. “Persistent market share gains by Mexico in recent years, importantly, suggest that the Mexican industrial sector has been restructuring just in time to benefit from renewed US competitiveness.